The first Auroville Marathon was on Feb 10 2008 and the running community was rather small in Chennai. All of us could fit in one small bus. Can you spot familiar faces in this photo from 2008? I could spot Balaji, Ashwin, KK, Siva, Mohan, Venkat, Sandy and Shumit. In 2008, we arranged for ONE small bus to take us all Auroville. We all met up at drive-in woodlands (which is now (செம்மொழி பூங்கா) Semmozhi Poonga.. wait a minute.. does that still hold? I thought Ms. Jayalalithaa got rid of that name !!!!!..) as the common starting point and rode down to Auroville from there. From that one small bus to several (50+ ?) car loads of runners this year, running movement in Chennai has come a long way in the intervening eight years. This time, I car pooled with Rajesh, Mahesh and Kavitha and comfortably reached Auroville around 4:00 PM. There was enough room within Auroville to accommodate us in 2008. In fact, almost all runners stayed within Auroville. We stayed in dormitories near the starting point for a nominal price. We got a big clean room with mattresses on the floor. This communal living gave us more time for gentle banter and connect with other runners and unwind before the run. Now, it is no longer possible to find accommodation within Auroville, which augurs well for the Pondy economy. Most of hotels in the vicinity get booked by runners well ahead of time. Thanks to Rajesh & Mahesh, I got a room in Surguru. Just as I expected, it was filled with runners from all over. 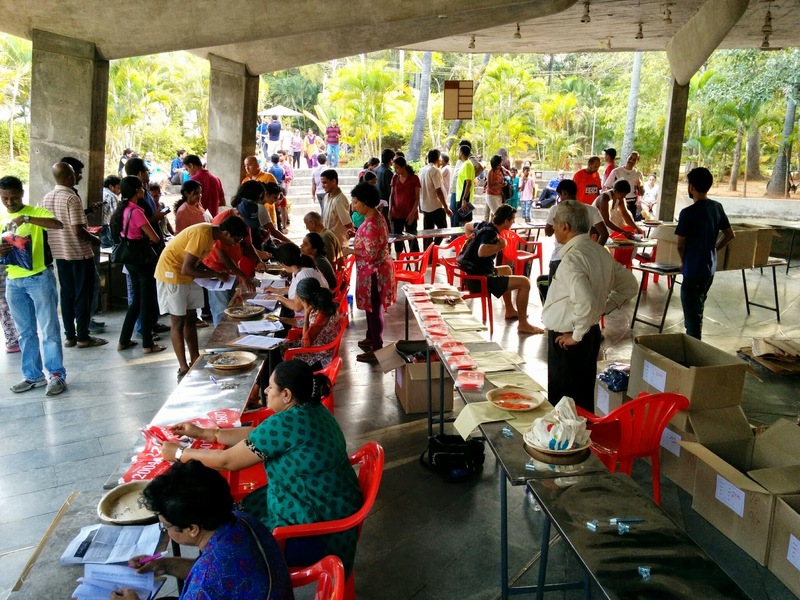 Bib distribution is always a simple affair in Auroville. In 2008, we got handmade cloth bibs and after that we hung around for the pasta party before retiring early to bed. Over the years, bib distribution has grown in size to require some process and manpower. 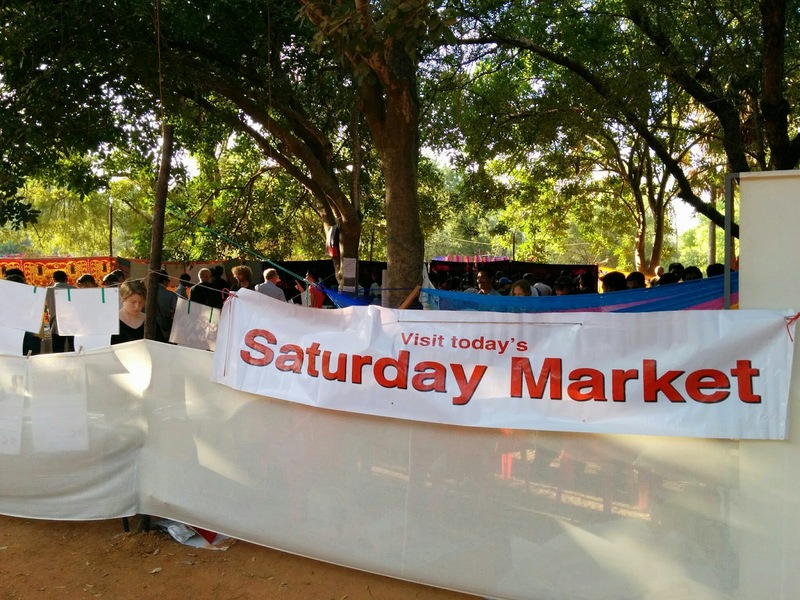 Yet, there is no change to the low key, no frill nature of Auroville Expo. For minute, I thought we got T-Shirt as well this year, but I was quickly told that I had paid for it separately, at the time of registration. Here is a short clip on expo. One welcome addition to the bib and 4 pins is the community market. Folks living in the community selling all kinds of unique stuff, but I don't think they are all made locally within Auroville. Nevertheless an interesting experience to hang around, meet runners and spend money. Here is a short clip of the saturday market. Another USP of Auroville Marathon is the pasta party. It used to all you can eat pasta and salad in a relaxed atmosphere. Over the years, as more runners started flocking to Auroville, the lines (and the price) at pasta counters have gotten longer and things have gotten busier. To avoid the rush, I chose the sumptuous Suruguru tiffin options this year. It also helped me hit the bed early. I had anxious moments getting to startline. For awhile, I thought I wouldn't make it on time. That story and more in my next post.. stay tuned.